Welcome to Why do babies cry? - Maternity, Baby and Toddlers. Babies cry to communicate to you. Crying is a normal, healthy behaviour, and it serves as communication tool for babies to seek help, comfort and to share emotions. All you need to understand is the reason why your baby is crying at that moment of time, which can be difficult for parents at the first time. 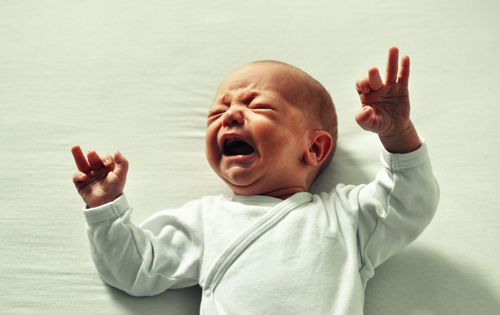 So here are the most common reasons why babies cry. This is the first and most common reason parents will think of when their baby starts crying. Look for early signs of hunger. The sooner you notice that your baby is hungry the easier and better experience you will have with him or her during feeding. And there are many early signs, when your baby is getting hungry - being restless, sucking their first finger, making little murmuring sounds, moving their lips or turning their head and opening their mouth. Babies inevitable swallow air when they are being fed, and it may give them discomfort if the air isn't released. Some babies will feel a lot of discomfort having just a little air in their stomach, whilst other babies don't get discomfort at all. Burping can help to prevent any gas getting stuck in their little tummy. You don’t have to make sure your baby burps after every feeding, but if your baby starts crying after feeding, the first thing you should try and “make him” burp. Many babies will have stomach problems associated with gas or colic, which can lead to crying. Stomach ache can give many hours of crying to a baby. Your baby is considered to have colic, if he is less than 5 months old, cries for more than three hours continuously for more than three days and at least for three weeks. If your baby cries after being fed, she may be developing a tummy pain. And even if your baby isn’t colicky, gas pain can be as troublesome for him, until it smoothened. Most parents use anti-gas drops bought over the counter for their babies but maybe none will have the same effect on your baby, so always get your doctor's opinion before using either of these. You can also help to release any gas just by putting your baby on his back and moving his little leg, which will help the gas to move along and don’t get stuck. Some babies will start crying immediately after they have pooped in their diaper. Other babies won’t bother about a dirty diaper and you will have to be smelling and checking their little bottom to make sure they are always clean. If your baby gets overtired, he will start crying. Some babies are also very sensitive about their environment and won’t be able to sleep straight away with new smells and different light. Pay attention to sign when your baby is getting sleepy: yawning, closing his eyes and making noises or turning his head away from light. Babies need a lot of cuddle to comfort them. They love to stay close to you, to feel your heartbeat and smell. As their vision is not so strong yet, the only way they can see you well, when you hold them. All parents fear a little this period. Some babies will tolerate better their teething than others, but very likely they will all go through some sleepless night and days. Teething can start as early as 4 month old. You can easily check their gums with your finger and you will feel any change or teeth coming through. Giving your baby teething toys will help for those cheeky teeth to come through a little faster. Using creams on the affected area, which you can buy over the counter (such as Bonjela) will help with your baby’s pain. Babies can cry if there is too much going around them or if too little. For example too many new visitors, noises and voices can be too much fro them to take in, and the only way they can tell you this is by crying. On the other side, they might also start crying when there isn’t enough stimulation around them. Even if you just start talking to your baby or give him something he can play with can calm him down and keep him busy. If you feel your baby is crying for none of the reasons above, you might want to check his temperature to see any sign of illness. The crying of a sick baby is also tend to be different and you will notice this, once you hear it, so just trust your instincts and call your doctor. Babies have their very good reasons to cry as they have no words to tell what is going on and if something wrong. Some babies are extra sensitive to things like clothes tags, fabric, light, how they are being held, noises or just even a the experince of a new bottle after you stop breastfeeding. It takes a little time to get to know your baby and understand the reason behind his tears, but soon you will know his routine even before he would starts to cry.